Cite your sources and resign before taking legal action if your contract is breached by the employer. It has come to my attention that (company name) is in breach of contract with me as an employee by (cutting my hours, posting my job without consultation, refusing a review session, etc.) 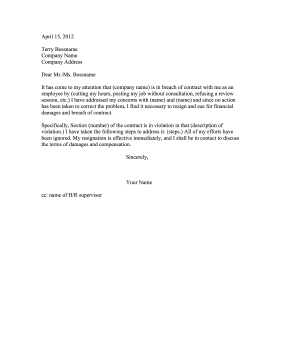 I have addressed my concerns with (name) and (name) and since no action has been taken to correct the problem, I find it necessary to resign and sue for financial damages and breach of contract. Specifically, Section (number) of the contract is in violation in that (description of violation.) I have taken the following steps to address it: (steps.) All of my efforts have been ignored. My resignation is effective immediately, and I shall be in contact to discuss the terms of damages and compensation.